I’m a second generation trucker. One thing experience has taught me is that communication is essential to ensure that cargo is picked and delivered on time. It’s also essential to ensure you’re safe on and off the road. Although I own a mobile phone, the Midland cb radio is my preferred means of communication when driving. The cool thing about cb radios is that you don’t need an FCC license to operate and they’re quite reliable in areas without mobile network coverage. The Midland cb 75 822 model is my favorite. Here’s my take on it. I no longer have to guess what anyone I’m communicating with is trying to say or desperately ask them to repeat or speak louder. 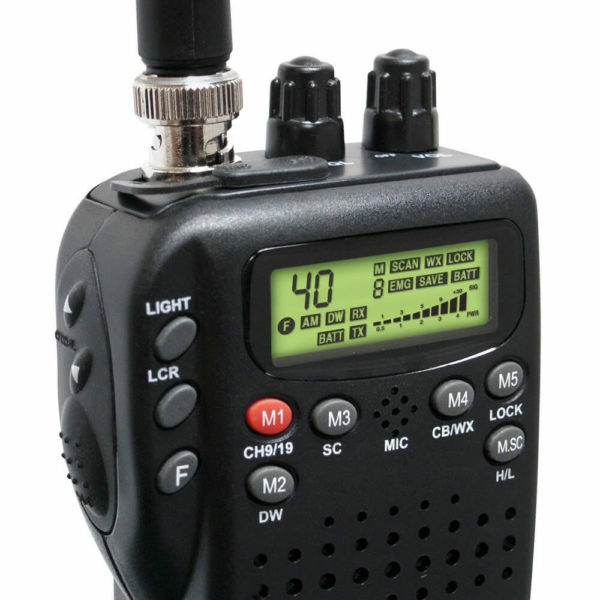 This cb radio includes a squelch control feature which eliminates background noise. The built in Automatic Noise Limiter and external antenna ensure that I receive a strong signal regardless of the location. The antenna can be dismounted for easy transportation and storage of the cb. This is one of the Midland portable radios that you can use in your car and as a mobile cb. The unit includes a mobile adapter which will power it via your car’s cigarette lighter socket. You can also power it up using 6 AA batteries and carry it as a mobile cb. A high/low transmit power setting feature allows you to set this cb at 4 watts or 1 watt output. This coupled with a battery life extender improve the unit’s efficiency when used as a mobile cb. For anyone who doesn’t want to invest in two cb radios for their vehicle and for off-road use, the 75-822 makes a good choice. There’s nothing complex about this cb. You can use it during the day or at night with ease thanks to the large backlit LCD screen. Your preferred settings are automatically stored in memory thanks to the built in keypad lock feature. If you prefer using this cb hands free, simply plug in a compatible Midland headset into the built in jack. A popular feature pointed out in many Midland 75 822 reviews, the 40 channels available is one of my favorites. Among these is access to 10 NOAA weather radio channels, channel 9 for emergencies and channel 19 for information. You can also simultaneously monitor channel 9 and another channel. You can easily scan for active channels and, save and access up to 5 channels in memory with a few button presses. One minor shortcoming I came across and think should be mentioned on this review regards the small antenna provided. It works really well when using the cb with the batteries. It becomes useless with the battery adapter attached. I eventually discovered that the cb is designed to work with an external antenna if plugged in to the adapter. I’d suggest having an external antenna mounted on your car if you’re to get any reception when using the cb while connected to the adapter. Before use one must install the batteries. There are two types of batteries. One is AA, try only (6AA). Cb radios are a good choice if you travel a lot and often find yourself in areas with little network coverage. The 75-822 Midland cb is a versatile unit that can be used both on and off road. It’s easy to use and features 40 different channels. Highly portable, it’s a good option for people who don’t want to invest in two separate units. If you’re looking for a reliable cb, this one is worth considering.